But what to give your loved one? Something useful? Something that won't end up cluttering the drawer for a year? Be original and give your fluff-a-holic a chance to splash out on some lovely cloth. 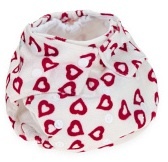 All year round we hear mums (and some dads) saying they would love to get that new fancy nappy for their little one: the one that matches an outfit, the custom-made embroidered one, the seasonal one (like the lovely Baba and Boo red hearts nappy featured above.). With a NapNap Voucher, your nappy addict in residence can choose the cloth nappy they want from 18 retailers. So if you know your other-half is a nappy-addict, enjoy our special Valentine's offer: with every NapNap Voucher worth £15 or more, we will send you a delicious bar of "Rawr" raw chocolate absolutely free. And the gift will include a handwritten gift note too. Rawr chocolate is the guilt-free raw chocolate bar and comes in four mouth-watering flavours: Dark, Orange, Goji berry & vanilla, Mint. 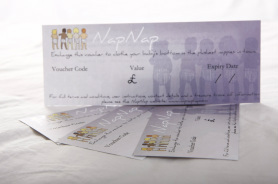 So order a NapNap Voucher worth at least £15 before February 14th 2012 and we will add a free 60g Rawr chocolate bar ( tell us your favourite flavour in the check-out notes).